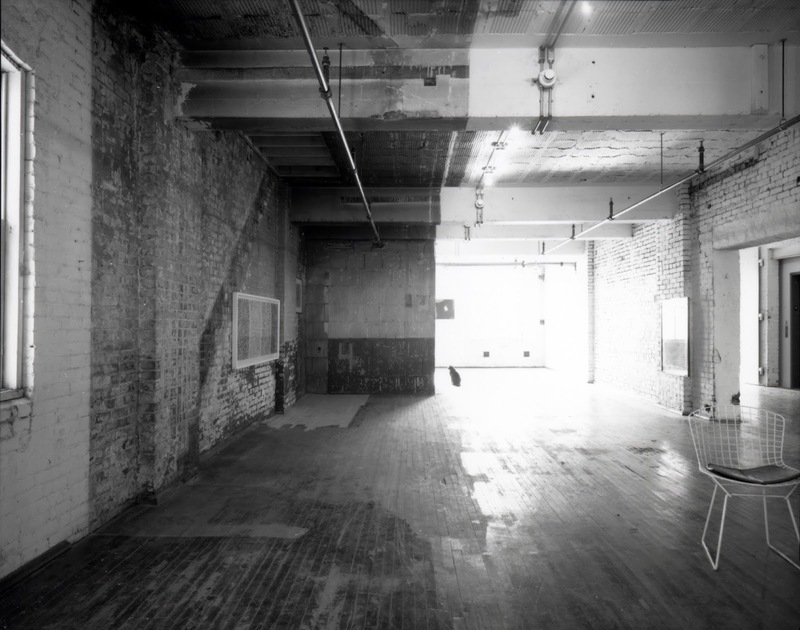 Today (Friday, February 28, 2014) is the opening of the Mattress Factory's second edition of Screenings, an installation of spontaneous film sketches inspired by the Mattress Factory's Gestures series. This exhibition will run for 12 weeks, allotting three weeks per artist. Each artist is presented with the opportunity to create a new video work specifically for exhibition on the Mattress Factory's large projector screen in the first floor lobby of the museum. I had the chance to speak with Owen Smith, the Exhibitions Manager and organizer behind the Screenings series, to get some insight into the makings of the series. 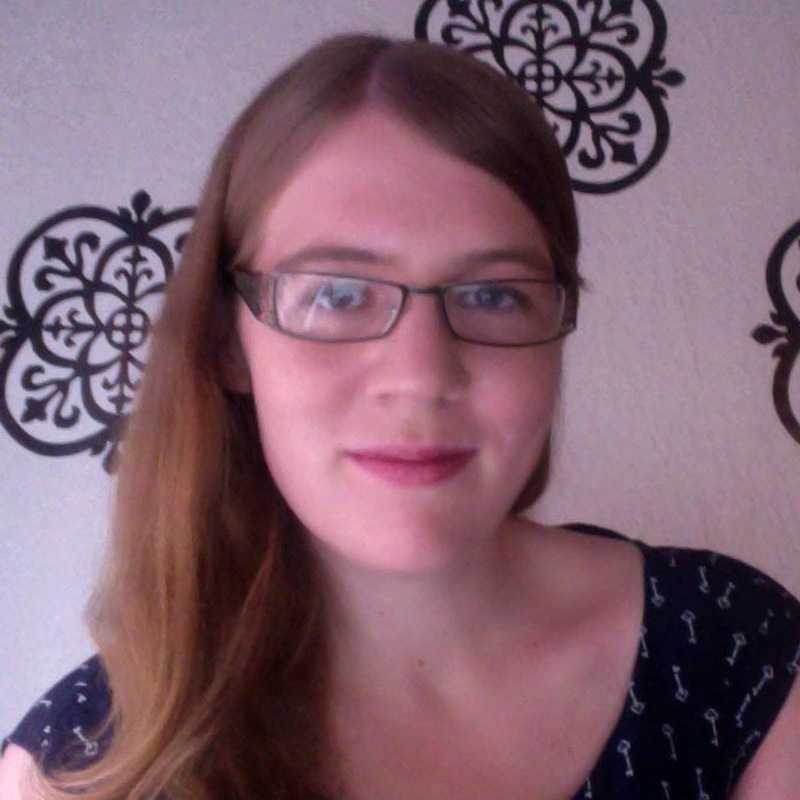 Caitlin Harpster: What is the Screenings Series exactly? Could you provide some background information for how the series first came to be? Owen Smith: Our first go at this series was last year around this same time (March 1 - May 23, 2013). It began as this idea to be able to better utilize the large projector screen we have in the lobby of the museum. I took inspiration from our Gestures series (which dates back to 2001) and thought it would be interesting to ask artists who may not typically work in this type of medium, to experiment and create a "film sketch" to screen in our lobby. CH: This is your second Screenings Series. What made you want to do this again? OS: We received very good feedback from the first series and I started thinking about the next. We have this great big projector screen and it's a great platform for artists to be able to experiment and take risks and create something that they normally would not create. It is also a fairly quick exhibition. It is only 12 weeks long, so it's sort of nice to have programming that rotates more quickly. The viewer can come back the very next week and be surprised to see something completely different than the week before. CH: There were more artists in the last series. Was there a reason why you limited the number of artists from six to four? OS: Last time there were six artists and the screenings ran for 12 weeks. That left only two weeks for each artist's work to be on view. Two weeks seemed too short. I wanted to expand the screening time of each film without expanding the exhibition time. Three weeks seems like a better balance. CH: What about the artists? OS: The artists I choose last year were from all different backgrounds in the arts such as documentary film, live interactive media, photography, etc. Three out of the four artists I choose this year specialize in some sort of film, whether it be experimental documentary like George Cessna, performative video like Di-ay Battad, or computer animation like Nate Lorenzo. I choose Delanie Jenkins specifically because her practice does not involve film or video. She is a sculptor. I am very interested to see what a physical sculptor will do in this situation. CH: George Cessna is opening the series tomorrow. Can you tell us anything about what to expect? OS: George's video is called I'm Not A Very Good Cowboy. It is a short quasi-documentary in the sense that it is about himself as a real subject, but it is also a performance by him. It is a silent video with subtitles, about four minutes long. He is struggling with this country-western persona that he has created for himself. I think a lot of people will relate to his search for a genuine connection to a thing he loves. For more information on last year's Screenings, you can check out our posts HERE. Hi everyone! It's Maria, your friendly neighborhood Visitor Services Coordinator. You've probably met me if you have visited the Mattress Factory lately -- I'm usually at the admissions desk collecting admissions and welcoming visitors to the museum. You may also know, if you've read my past posts, that I also manage the Mattress Factory's Volunteer Program -- and I'm posting today to introduce a new feature about just that! The Mattress Factory's volunteers are a team of amazing, dedicated individuals. They provide support at every level of the museum, from administrative help to gallery attending. Our programs, exhibitions and events just would not have the reach and the impact they do without help from our faithful volunteers. One of my favorite aspects about working at the MF is managing the Volunteer Program and working with all of the generous and interesting people who make up our volunteer pool. We're going to start featuring some of these volunteers regularly on the blog so you can get to know them, and a little more about what it's like to donate your time volunteering at the Mattress Factory. If you're interested in joining any of these fantastic folks, or would like to talk more about volunteering, e-mail volunteer[at]mattress.org to chat with me (Maria) about our Volunteer Program. So, without any further ado, allow me to introduce our first volunteer to be featured on the MF's blog: Karlee Turkaly. How long have you been a volunteer at the MF? I have been volunteering for the Mattress Factory for one year now. Aside from working full-time and going to school, I typically go out to eat here and there, check out what's going on in town, browse around goodwill, and exercise. Who are your favorite artists, MF or otherwise? James Turrell always hits a note with me. I am also a big fan of Robert Mapplethorpe, Jean Michel Basquiat, Roy Lichtenstein, and Baldaccini, just to name a few! What made you decide to become a volunteer for the Mattress Factory? Schedule flexibility is what won me over to volunteer with the MF. My schedule is very unpredictable so I can't commit to every Saturday, for example. The Volunteer Program at the MF is very understanding and adaptable in scheduling around issues and I really admire that. I feel respected and cared for with that kind of flexibility. Helping out as a volunteer gives you an insider's perspective that the typical visitor does not get. 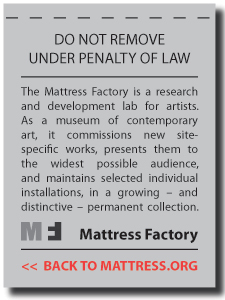 What is something you wish people knew about the Mattress Factory, but probably don't? That's a really good question. I would probably wish people knew the organizations and management that goes into events held at the museum. There are insane amounts of details to consider, people and vendors to contact, venue layout, keeping in mind of the people who live nearby, etc. And to get volunteers on board is probably a whole other story! 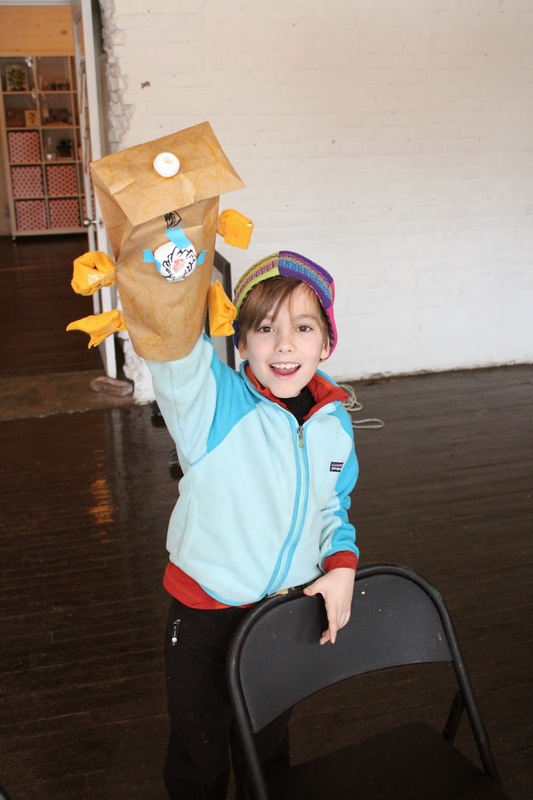 As usual, the Mattress Factory’s first Saturday of the month was a huge success with ARTLab! This week’s installment was “Puppet Party,” where educator, Derek Reese, and MF visitors explored the many intricacies of puppet making through a wide range of styles and sophisticated designs. While some devoted their time to elaborate sock and shadow puppets, others focused on creating marionettes. Two participants in particular collaborated together to create an almost life-sized marionette of a mermaid, complete with sequined scales. This imaginative creature was then paraded throughout the museum in full performance. Be sure to join us next time on March 1st as part one of four Photovoltaic Solar Energy and Art Series (PV-SEAS) installments. Educator, Indigo Raffel, will be joining us from the Conservation Consultants Inc. to increase awareness of solar energy and its benefits on our environment. Hands on solar games, educational projections, and a mural inspired by Design 99’s Following the Sun 2, will make up the three stations available for the next ARTLab. ARTLab is a great opportunity for people of all ages to come together and create art through laboratory style activities that promote and encourage visitors to use different materials and discover the benefit of problem solving with their hands. We hope to see you every first and third Saturday of the month to investigate new and exciting methods of art making! 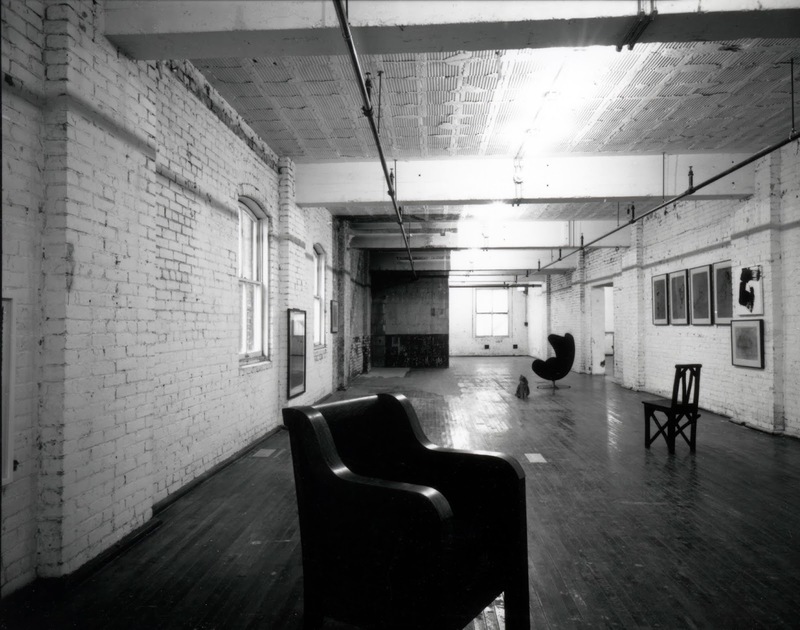 This ARTLab will be held off-site at the Conservation Consultants Inc. Center at 64 S. 14th St. Pittsburgh, 15203. A bus will transport ARTLab participants from the Mattress Factory to the CCI promptly at 1pm. Reservations are required. E-mail felice[at]mattress.org to reserve your spot. 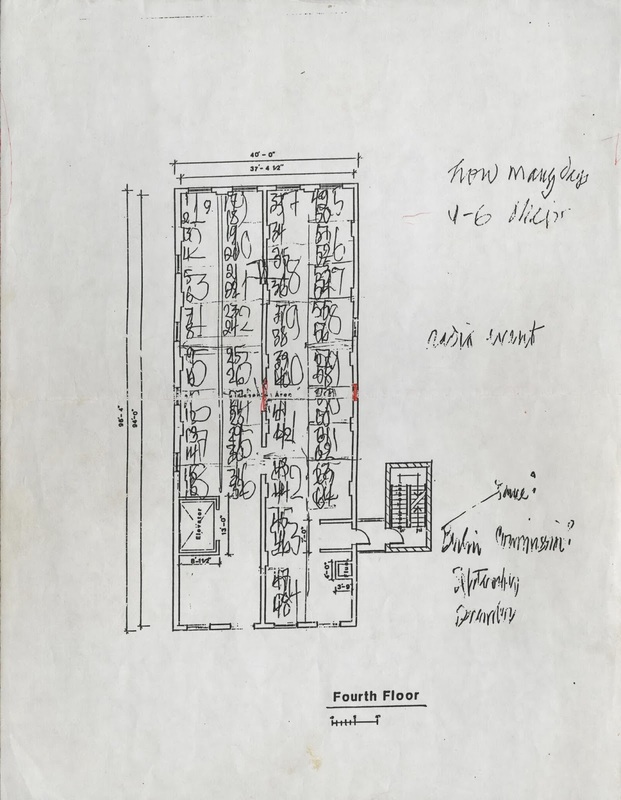 As an MLIS (Master of Library & Information Science) graduate student interning in the Mattress Factory Archives, I have a unique opportunity to work with records, documents, and photographs, which tell the story of the museum and the artworks created over the museum’s 35-year history. There are many amazing relics in the MF archives and I help preserve and provide access to this material for students, researchers, and artists. 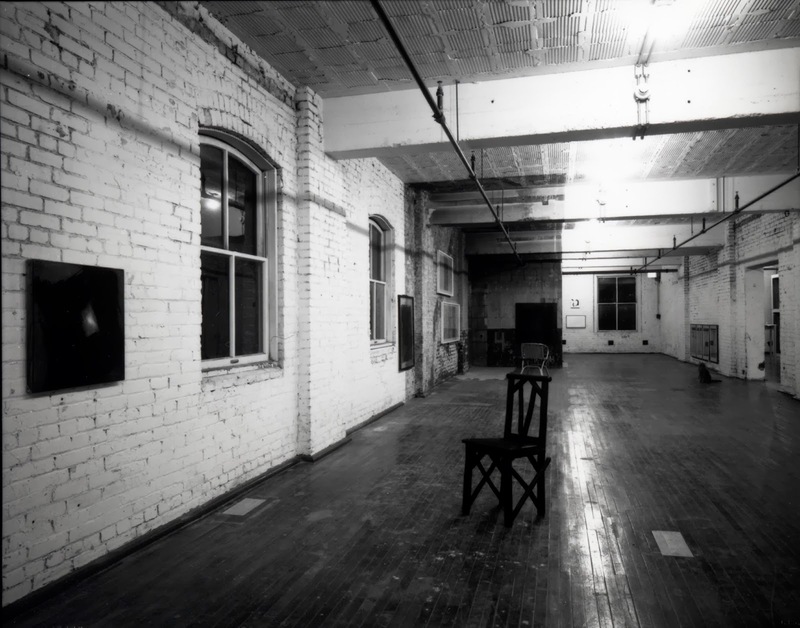 One of my favorite collections is a group of images of John Cage’s 1991 changing installation, an artwork exhibited as part of the 1991 Carnegie International. While cataloging, digitizing, and organizing these photos, I noticed an unexpected surprise that exemplifies the serendipitous magic that so often happens with artists working at the Mattress Factory. Most well known for his musical compositions, John Cage (1912-1992) also expressed himself as a poet, artist, and writer. In changing installation, 1991, Cage combines the use of two-dimensional works with poetry, all while maintaining an exploration of concepts surrounding randomness. The concepts of randomness and chance are frequently woven into Cage’s musical compositions, such as Music of Changes (1951) and the 85-part series, Music for Piano (1952-1962). For more about John Cage’s work, check out the John Cage Trust. 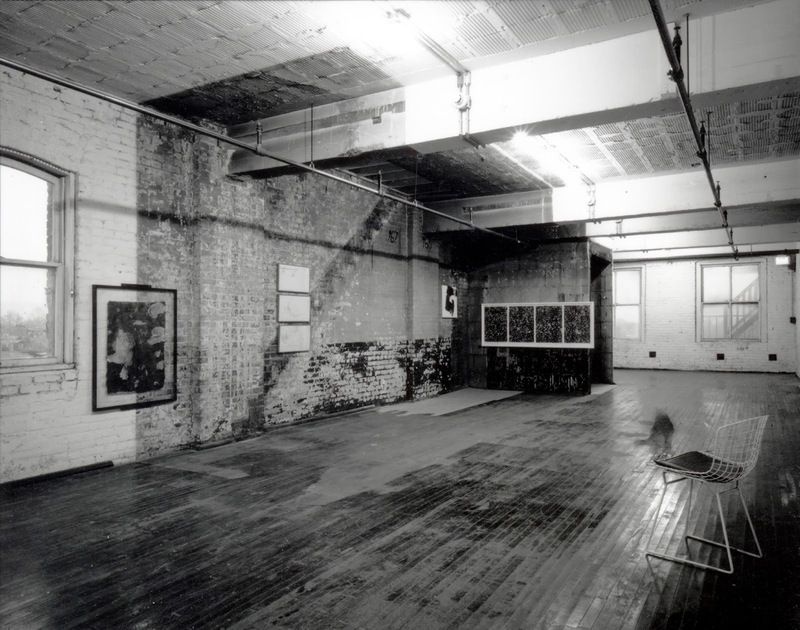 Based on the concept of “controlled randomness,” changing installation consists of two-dimensional works by artists Dove Bradshaw, Mary Jean Kenton, John Cage and Marsha Skinner, along with six chairs that rotate around the exhibition space in an order determined by a computer algorithm. The six chairs are: one Bertoia Side Chair, one 1940s aluminum lawn chair, one Arne Jacobson Egg Chair, one chair made from sticks, one Empire chair, and one steel chair made by a steelworker. 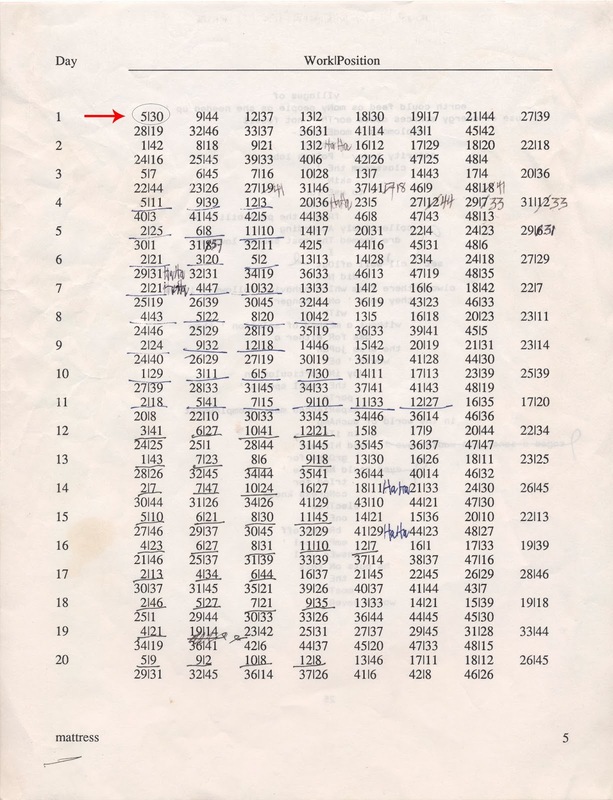 John Cage hoped to present randomness (in this case, the computer generated numbers), in a controlled and orderly way (through the use of clear and precise installation instructions). The installation was on view for 102 days and each day the chairs and artworks were rearranged based on placements outlined by the computer algorithm. Museum Co-Director Michael Olijnyk photographed the installation each day from a vantage point identified by the computer algorithm. Wall Label for changing installation, 1991. 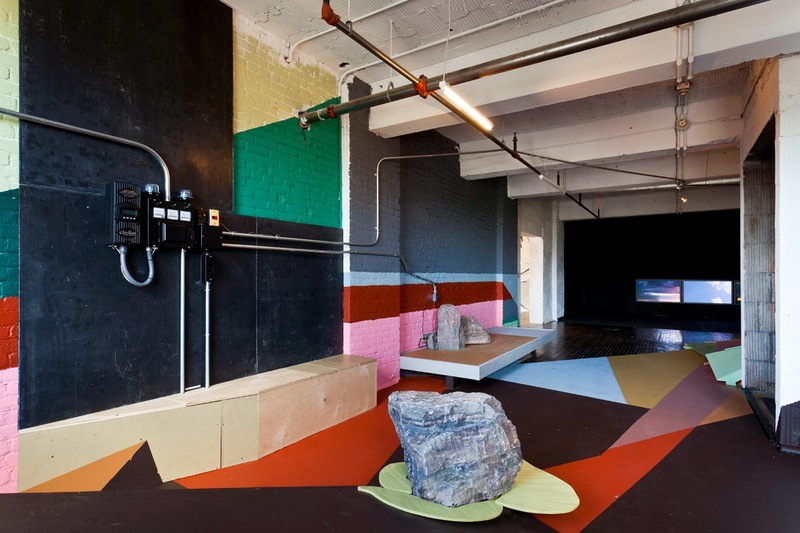 Each artist provided 12 works to be used within the installation. The works each have an assigned number and a combination of 15 works was shown every day. 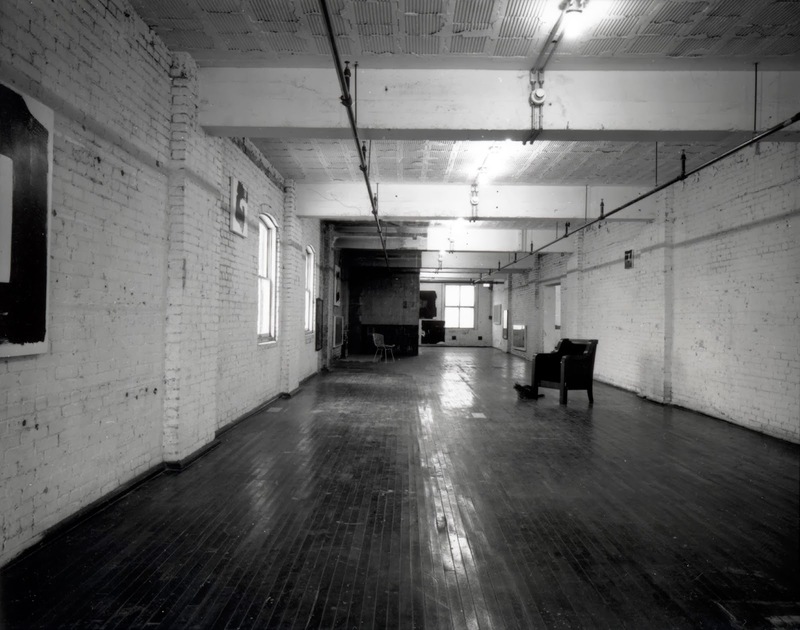 The entire fourth floor of 500 Sampsonia Way was divided into distinct locations for changing installation. 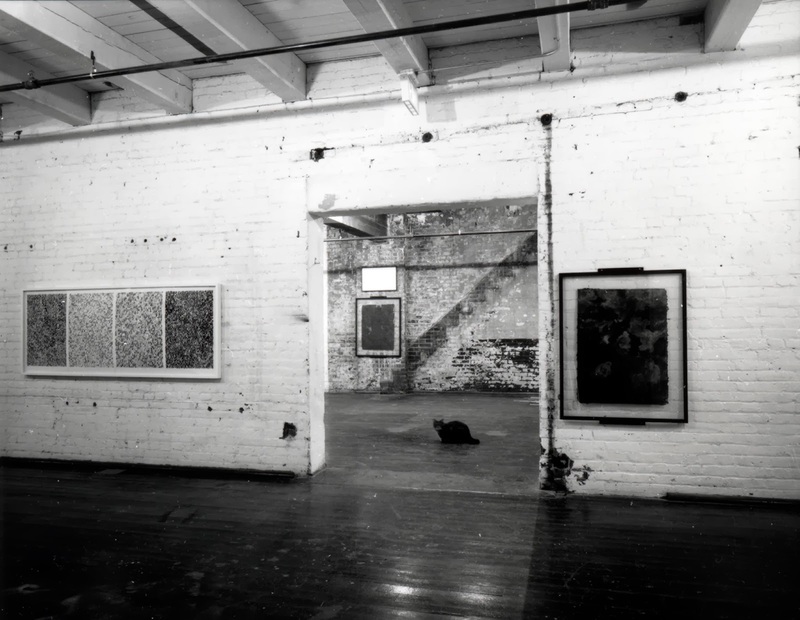 Cage gave each corner of the gallery a unique number ranging from 1-64. 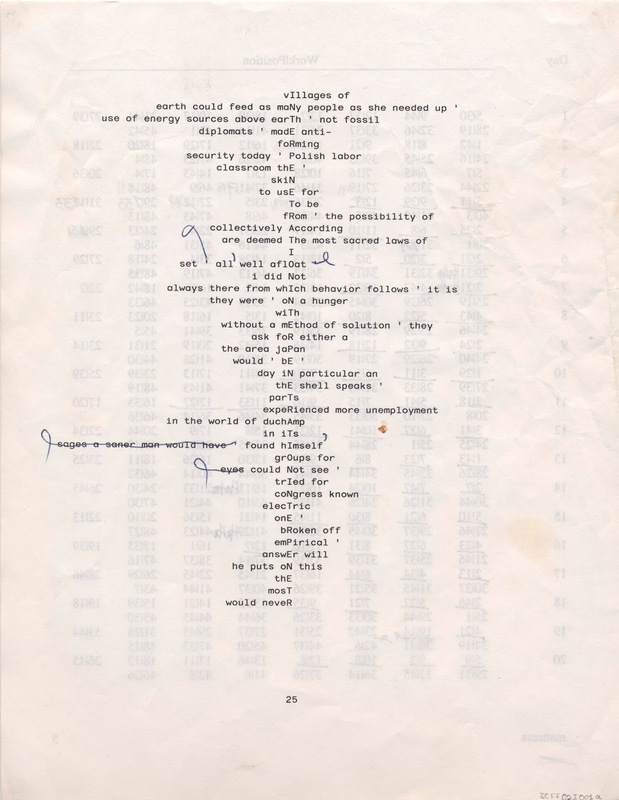 Based on the computer algorithm, John Cage’s script lists the works to be displayed each day, their location, their display angle, and the placement of the camera. Here, this script page indicates the works to be shown and their location within the gallery for the first twenty days. For example, on day 1, work 5 is shown in position 30. 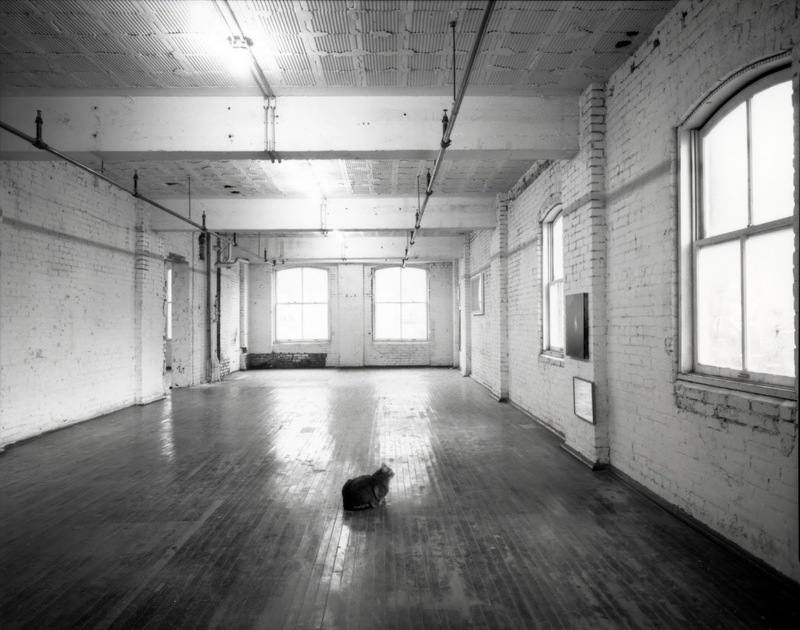 Each morning Museum Co-Director Michael Olijinyk took “down the works from the previous day, put in place the new arrangement of chairs and artwork” and “photograph[ed] the space.” During this process, his pet cat, Godzik, would follow him around the gallery. In some photographs, Godzik placed himself directly in the center of the installation (and image), and in others, he appears as a blur or a reflection. Rather than retaking the day’s image, Michael Olijinyk noted that the cat’s appearance was “in complete accord with Cage’s concept of incorporating random sounds and occurrences into his work.” All in all, Godzik can be seen in 17 photographs and is a surprising addition to an exhibition already based heavily on randomness. As you can see, through my internship at the Mattress Factory Archives, I have the chance to work with some fantastic collections and amazing artwork. The museum is made up of a multitude of moving parts, and as I continue to explore its history, I’ll gather more interesting stories to share! Cage’s Music, Poetry, & Art. Chicago: University of Chicago Press, 2000. Collection Curriculum Guide.” Last Modified 2009. 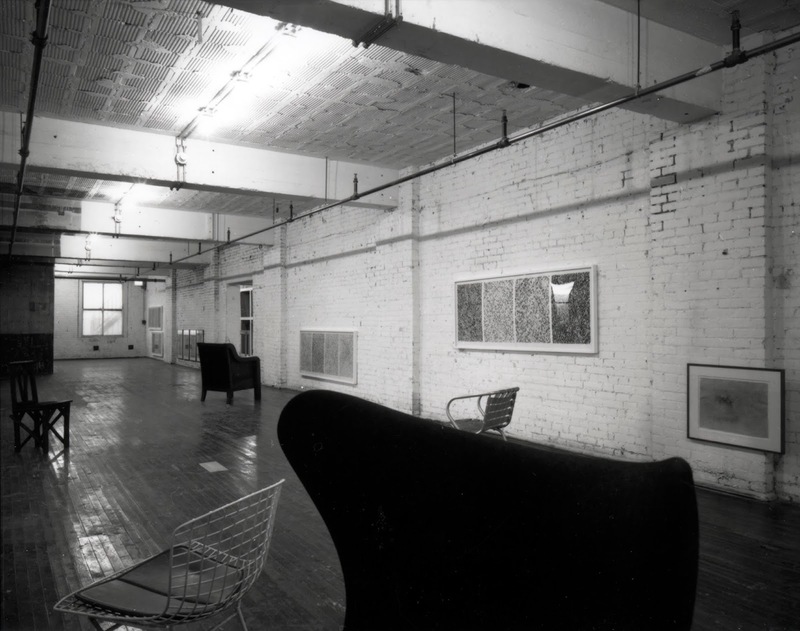 Mattress Factory, 1990-1999. Pittsburgh: University of Pittsburgh Press, 2001. David W. Bernstein and Christopher Hatch (eds. 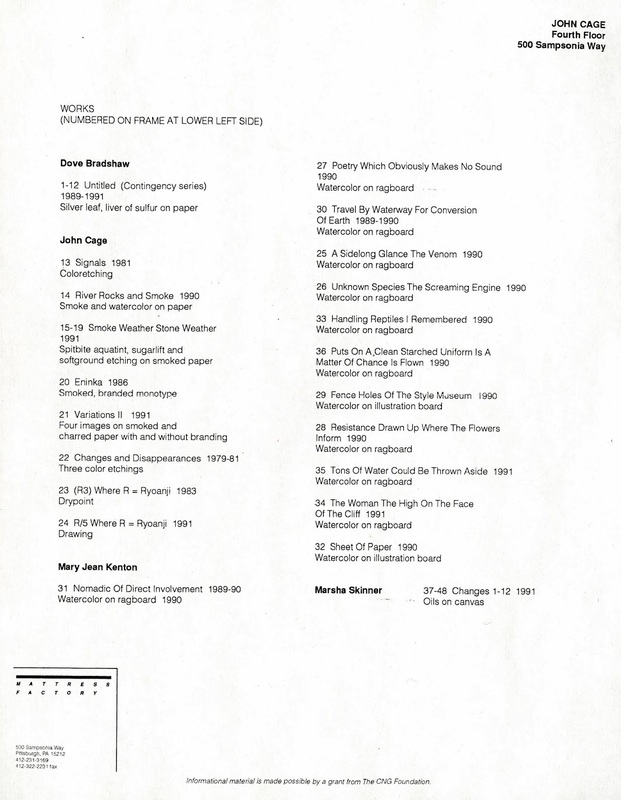 ), Writings Though John Cage’s Music, Poetry, & Art (Chicago: University of Chicago Press, 2000): 5. Mattress Factory Education Department, “Mattress Factory’s Permanent Collection Curriculum Guide,” last modified 2009, http://www.mattress.org/documents/2009_curriculumguide_web.pdf. -Biking, going to the cinema, and traveling. -At the moment, I’m playing Passenger constantly. Folk makes up the majority of my current playlists. -Julia Child—if anyone could help improve my cooking skills, it would be her! 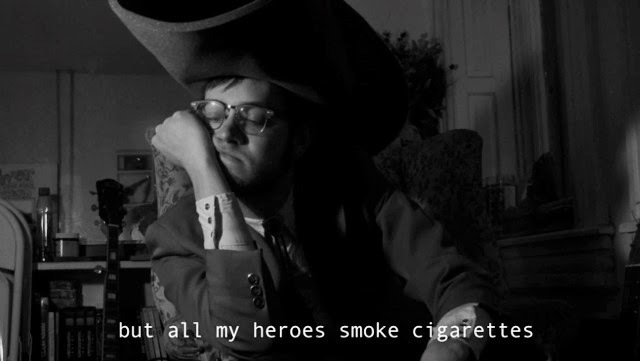 -I’m an intern at the Mattress Factory and a graduate student at the University of Pittsburgh.